Some very good friends of ours, Louis and Ana, together with their kids, Reg and Romi, have been spending every summer for years back in Ana’s homeland of Croatia. They’ve been telling us how wonderful it is, but until this trip, we’ve never got around to coming. About three or four years ago, they finally did what Louis’s been threatening for years – sold his workshop, and moved out here wholesale. We intended to come and see them last autumn, but – of course – that didn’t quite happen. Finally, we’ve made it. Only nine months late, and only six weeks after arriving in the country. They live in Samobor, a very pleasant little town just north-west of Zagreb, surrounded by rolling and heavily wooded hills. Their house is on land that Ana’s family have had since before the days of Communism, managing to keep it out of the hands of the state only by good luck and some timely building work. That building work is now almost finished – and what a house has resulted! High on a hill above the town, it was surrounded by farmland and olive groves back then. Now, of course, the town’s edge has arrived and they’re in the middle of one of the more upmarket suburbs, with the road curling up past their house towards the forest. 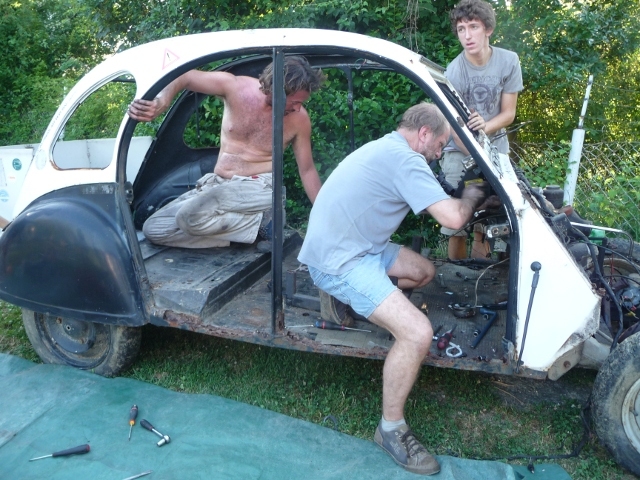 We’d barely arrived at the house, when it was time to turn around and head out – Louis is a 2cv mate, and we had an appointment at a local 2cv’ers place for a barbeque. Even better – there was a reason for the barbeque… We had a car to dismantle! Sat at the back of Strečko’s house was a forlorn and tatty black and white 2cv, which clearly hadn’t moved for years. Fortunately, there was a handy quadbike to tow the car into the shade, ready for work to begin. A tow-rope was hooked on. The quad was revved. PULL! Ooops. We all ducked as the front bumper flew through the air, still attached to the rope. Eventually, work began. Spanners moved in a blur, sweat poured off, dead car parts were thrown into rubbish heaps. Just over an hour later, the car was barely recognisable – and it was time to clean up and dive in to the beer and food. Ah, the good life! 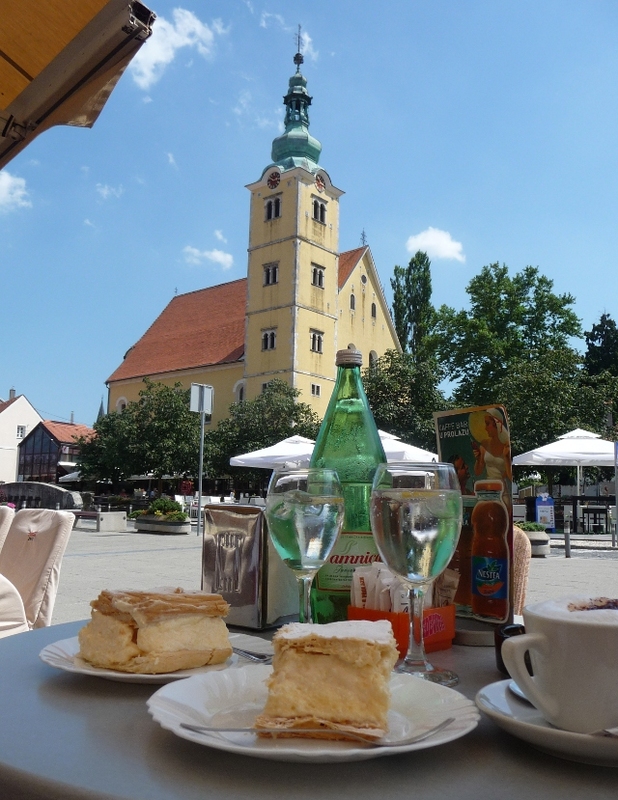 Samobor’s main culinary claim to fame is a creamy pastry – Kremšnite – and to visit the town without trying it is, apparently, unforgivable. Who were we to argue with that kind of tradition? It looks a bit like a big wobbly custardy splodge, sandwiched between puff pastry dusted in sugar, but is very egg-rich and tastes surprisingly light and fresh. Utterly delicious, eaten outside in the town square underneath the onion dome of the church. The other local must-try is the wine. 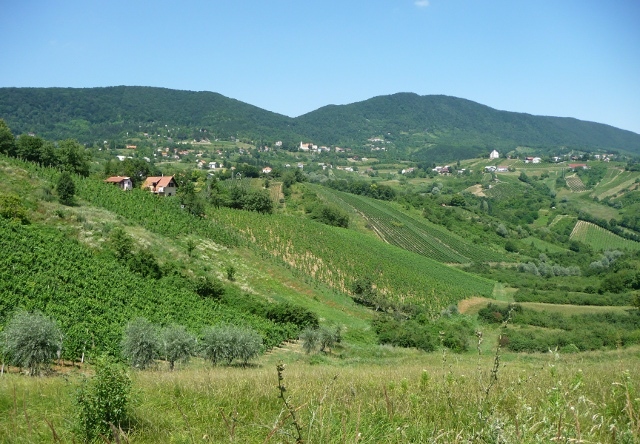 Over on the far side of the hills, vineyards cling to precipitous slopes, with the rolling landscape seemingly compressed horizontally. As well as catching up with old friends, we had an ulterior motive. Louis has a workshop in the middle of town, in a gently ramshackle old candle factory and pig yard… Derelict 2cvs lie all over the place, providing a home for the workshop cat – Mosse – and her three tiny kittens. The kittens are tucked safely away in the loft, accessible only by a steeply angled plank or a very rickety wooden ladder. Ellie would normally not even being to consider climbing up, but the lure proved far too strong. I managed to tear myself away from them, and catch up on a few jobs on the van – not least removing and re-sealing the roof windows. Heavy rain has brought water into the van since we bought it, but we think that’s now sorted. The two roof windows had been out at some time, and badly sealed, the rear one particularly so. I’m not a great fan of heights, and standing on the very top of a step ladder, leaning against the roof of the van in the hot afternoon sun was not one of my favourite pastimes. We’re now almost – almost – hoping for some rain so we can see if it’s sorted! 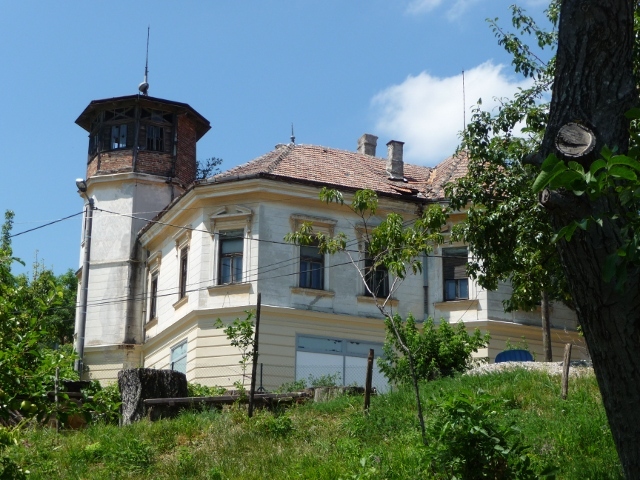 As well as the house in Samobor, the family also have a summer house on the coast, just north of where we’d managed to get to before being kidnapped to Karlovac. The unusually hard winter this year wreaked havoc, with frozen pipes wrecking almost all of the plumbing. A new pump was already installed, but the boiler, shower, taps, loo cistern and a few other odds and sods were still to be done. 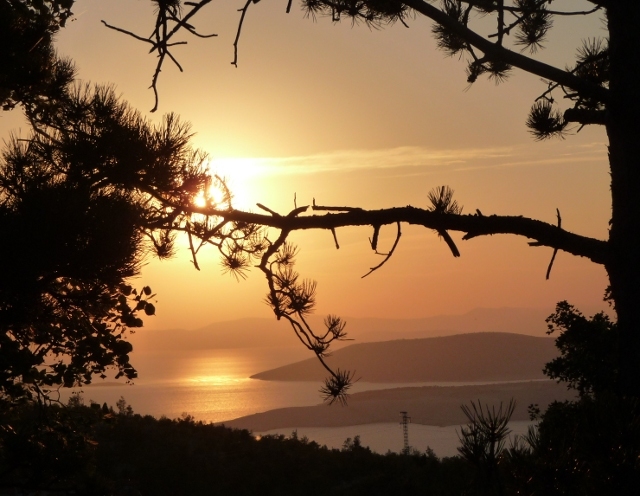 Off we convoyed, eventually heading over the Velebit mountains again, with spectacular views across to the islands of Krk, Rab and Goli Otok. The cottage is up a tiny track, barely wide enough for our van to squeeze through. It’s another family heirloom, with the hamlet sharing Ana’s maiden surname, and the well in the garden having the initials of a very early 20th century relative marked on the rim. We squeezed the van under some trees, providing us with a cracking camping space, and got stuck in to the plumbing. Once the back of the work was broken, it was time for the beach. Just up the main coastal road is a very small sign pointing down a matching road, which twists and turns as it clings to a precipitous cliff face. At the bottom is Lukovo, a tiny fishing village on a beautiful bay. A few hours passed easily, swimming to the other side of the bay and leaping about on rocks. Louis and Ana swapped a snorkel between them, competing with each other to see who could find more fresh shells, with the inside gleaming and glinting a bright mother-of-pearl rainbow of colours. Truly an enviable life. This entry was posted in By Country - Croatia, Food stuff, Personal stuff, Travel stuff, Van stuff, Wildlife stuff. Bookmark the permalink.